Both will Premier in Japan on December 19. The Official website for the second film of Yo-kai Watch, called “Yo-kai Watch: Great King Enma and the 5 Stories, Meow!” has announced that another Level-5 production will be acompanied him: the Snack World film. Snack World is a “Hyper Casual Fantasy” that it looks like a generic fantasy theme. But on that world there are smartphones, convenience Stores and other comodities of the modern world. 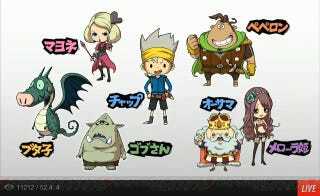 Snack World, besides havin a Movie, will have Video games, toys, manga and Anime. SInce Level- 5 tries to make it it´s next Yo-kai Watch. Yo-kai Watch games and Animes have already come to the west since this fall.